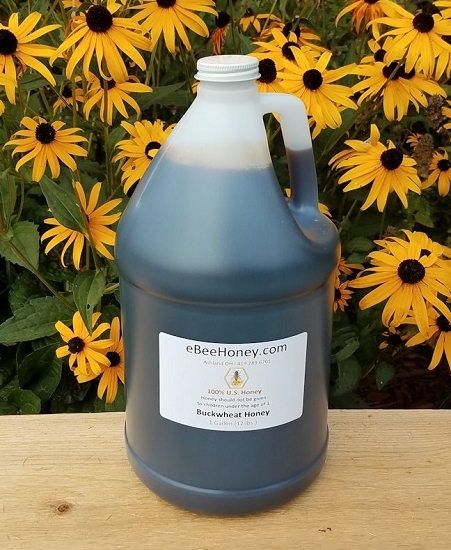 Buckwheat Honey in a 1 gallon container. 12 pounds of honey. This honey has been heated and filtered. If you wish raw honey, click on the "raw honey" link. 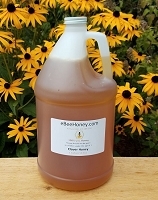 Buckwheat honey in a 1 gallon container which is 12 pounds of honey. Buckwheat honey is pungent in flavor with molasses and malty tones and a lingering aftertaste. Buckwheat honey is also very dark in color. HIGH QUALITY, GREAT CUSTOMER SERVICE and The Fastest Shipping possible. What more could one ask for? Da Best, Tastiest, perennial favorite of mine. Swift order fulfillment, attentive customer service, well packed. Not a drop of this precious honey spilled. No wonder why Da Bears love Da Honey. Been doing business with ebeehoney for years, and will continue with them for a long time to come. Y'all have my gratitude. The buckwheat honey tastes great. I have been getting it for years. The customer service is excellent! Using the buckwheat honey to make a substantial batch of mead for the fall. I have not tried it yet but it is fermenting nicely. Previous batches have turned out great using this honey. It makes a slightly darker heavier mead than clover honey.